The 585-page withdrawal agreement (pdf) destroys all the myths that have been peddled by the hard Brexiteers about the bountiful future that waits outside the EU, the Single Market and the Customs Union. Unfortunately, because it resolves nothing positively about any of those issues, the agreement is also deeply damaging, as it prolongs the uncertainty indefinitely in each of those areas. As a result, workers can have no confidence that their current rights will be upheld and businesses are discouraged from investing. Some may even decide to relocate. That is why Jeremy Corbyn and the Labour Party are absolutely correct to make clear they will vote against the deal. 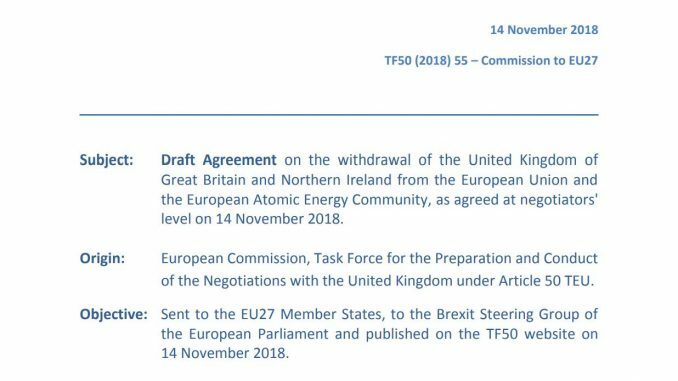 Essentially the withdrawal agreement postpones every major decision until an indefinite point in the future. Article 132 states, “Notwithstanding Article 126, the Joint Committee may, before 1 July 2020, adopt a single decision extending the transition period up to [31 December 20XX]”. At the same time, the 7-page political declaration (pdf) resolves nothing at all. It merely provides headings for areas that need to be agreed. Despite this, there is a concerted effort by large sections of the British ruling class to bolster May and this deal. The editorial line of the Financial Times is clear. The FT would prefer a better deal but this one is much better than crashing out without any deal. This was then followed by a sycophantic ‘In praise of Theresa May, a serious politician in an age of pygmies’ piece. The head of the CBI is reported to be willing to publicly support the deal. Jeremy Corbyn and the Labour leadership are entirely correct to reject all this pressure and firmly oppose the deal. There is intense Tory pressure to fall in behind May’s deal. Tory Hard Brexiteers have struggled to gather the 48 letters demanding a leadership contest. Innumerable commentators who have been attacking Jeremy Corbyn because he is not as shrill in his denunciation of Brexit have now somersaulted and are pro-deal. Their only consistent position is that they are anti-Corbyn. The Labour right have largely stayed on the sidelines, given the initial widespread criticism of the agreement. But some of them may need little encouragement to support the Tories against the Labour leadership. Jeremy Corbyn has consistently argued for opposition to May’s deal. He is right to do so. The call for a general election and keeping open the option of a ‘people’s vote’ on the terms of the deal makes the point that Brexit is a key issue among others and that there can be no confidence in a Tory government to deliver on any of them. Given the provisions of the Fixed Term Parliaments Act John McDonnell is also right to emphasise that a ‘people’s vote’ would be easier to achieve. Labour is outlining an alternative to Theresa May’s mess. Her plan may not pass in parliament. Labour has made clear it is not ruling out any variant on how to stop a hard Brexit and May’s deal. By far the best is a general election, but also possible is a referendum on the terms May has negotiated. Also to be considered as preferable to May’s deal is anything which maintains membership of both the Single Market and Customs Union. . The first most important step has been taken by Jeremy Corbyn’s firm opposition to May’s agreement, which has united all but the most extreme Blairite fringe of Labour. This opens up the way to prioritising jobs and living standards in dealing with the mess created by the Tory position on Brexit.